Joined by their roots, Rangers minor leaguers Sammy Sosa, Juan Gonzalez, Ray Sanchez and Felipe Castillo spent much time together in 1986 as players in the rookie Gulf Coast League, Sosa wrote in his autobiography. They also spent time eating together, to the eventual dismay of a local restaurant owner, Sosa wrote. "During extended spring training, Sunday was our only day off," Sosa wrote, according to John Morrison's book on the slugger, "so we would always go there ... I remember the owner couldn't believe how much we could eat. And after a while, he'd see us coming and yell, 'No, no! No ballplayers! You eat too much!" Unlike the others at that restaurant table, who would make the majors, Castillo would not. In a career where he is recorded playing as late as 2001, Castillo made it to AAA, but never made the bigs. Castillo's career began in 1986, signed by the Rangers as an undrafted free agent out of his native Dominican Republic. Castillo spent that first year getting into 13 games in relief for the rookie league team. In 14.2 innings of work, he gave up 13 earned runs and picked up a loss. He moved to single-A Gastonia in 1987, turning starter. He went 7-8, with a 4.36 ERA. He played the next season largely back at Gastonia, with four games in the Florida State League at Port Charlotte. In 27 total starts, he went 7-11, but had a 3.00 ERA. Castillo made it to AA Tulsa for 1989, going 8-12, with a 4.42 ERA. 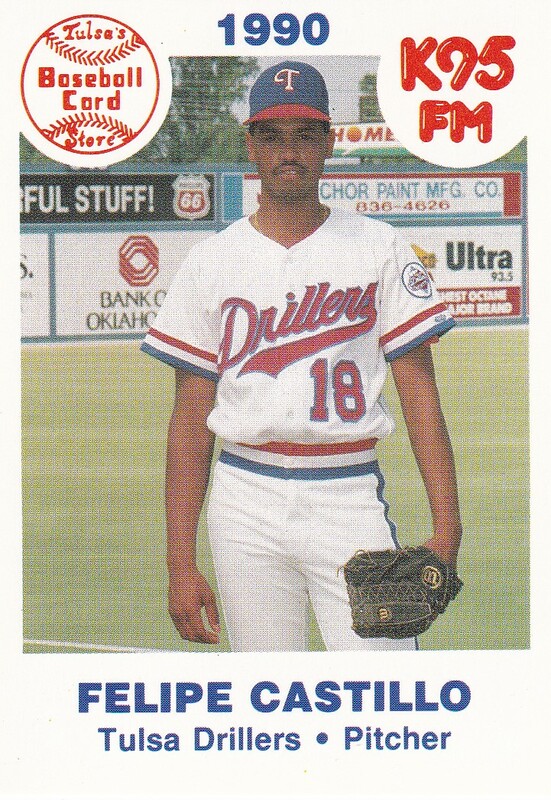 It was back to Tulsa to start 1990, but Castillo eventually got promoted to AAA Oklahoma City. At Oklahoma City, Castillo got into 20 games, mostly in relief, posting a 3.45 ERA. Castillo is not recorded playing in the U.S. again until 1995, but, in 1994, he spent time playing in Taiwan, according to The Dallas Morning News. Castillo returned to Tulsa in 1995 for 14 games in relief. Castillo isn't recorded by Baseball Reference as playing again until 2001, with independent Fort Worth. He played five games there and five games with Cordoba, marking the extent of his recorded playing career.